Help retrieve a tailor's supplies. A tailor tried to take a shortcut through Cambray Pass and was attacked by a pack of wild wolves. He lost the tools of his trade as he fled. He asked me to retrieve his possessions and meet him at the northern end of the pass. Find Odei at the north end of the Pass. Talk to Odei Philippe in Cambray Pass, north of Aldcroft. Odei will ask you to find a sewing box, pack of silk threads, and a tailor's book of patterns. After collecting all three items, meet Odei at the north end of the Pass. 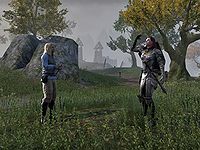 Instead of finding Odei, you will find a Lion Guard soldier and talk to her. This will finish the quest. This page was last modified on 14 August 2017, at 20:27.